The downturn in the economy has opened up possibilities in many sectors of the real estate market. First time buyers are able to afford homes in areas they want to live, move-up buyers are now able to get much more home than they would have five years ago and many people who thought living on the water was only a dream . . . have seen it become reality. William Rogers Road in Indianola closed for $551,000 in May of 2011. Bank Owned. We have been witness to some true blue waterfront values this year in Kitsap County . A bank owned, new construction waterfront home in Indianola, sold for $551k last month. This Cape Cod Style home of nearly 4,000 square feet sold for a mere $141 a square foot. 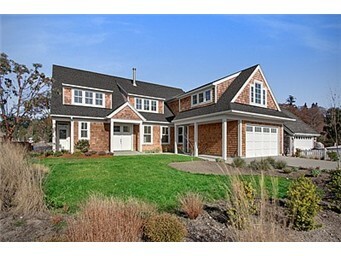 This 5,600 square foot home on Whitmore Lane in Bainbridge Island closed for $685,000 in June of 2011. Bank Owned. Another bank owned home on Bainbridge just closed for only $121 a foot last week. This view home with sandy beach tideland rights was built in 2006 and was lived in for only a short time. This 5,600 square foot home with an impressive back deck and outdoor fireplace that enjoy views of Rich Passage closed for just $685,000. There are certainly more where those came from – this summer anyway. And, you don’t necessarily have to wait for a bank owned or distressed sale. There are sellers out there who are pricing their homes to sell quickly – at or below market value. In 2010, this time last year, the average price per square foot for waterfront or homes with beach rights was $287 ft – in North Kitsap and Bainbridge. In 2011 that number is down to $278ft. In 2007, the average price per square foot was $442 at the end of June – a whopping 37% drop in price. As an agent I see the “Relocation Expert” tag line on countless marketing pieces. Many agents use it and when you think about it, any diligent agent is a relocation agent because, at the very least, agents help people move from one home to another. What Does a Relocation Client Need? But, Relocation Expert means something a little different to me. But, more important is what it means to my clients. What type of assistance do they need to make this momentous move? From my experience and research, relocation means moving your family, usually out of state and always to a new community. Many times a company is involved that is helping with the moving process logistically and financially. The agent is a big part of the process and having experience with relocation companies like Cartus is key, because they actually become the seller in a company relocation. Click photo above to see a sample property preview. But what is really important to the relocation client, the buyer in many of my transactions, is that the agent is helpful at assisting the buyer long distance. Buying a house, long distance, even sight unseen sometimes, is not an easy thing to do. You need an agent you can trust, one who will tell you if the house smells, is on a bad street, has a strange history, has a bad vibe, is dark, has been lived in hard, or is just not right for you. You want your agent to provide you with information you can not see on paper. What you don’t want is an agent who just wants to get into contract so they are on their way to getting paid. Buying a house sight unseen is not usually ideal, for the buyer or the agent. I try to give the client a “foot on the ground perspective” of the home by taking dozens of unprocessed photos (which are very different looking from the wide angle, doctored photos in many MLS listings). And I shoot narrated videos with my handy HD FLIP video camera. What many people don’t know is that much of my website is not public. My active clients, buying long-distance, have a password protected portal where they can privately log in and see the photos and videos I have taken just for them. I was just talking with someone the other day who is in the process of buying a house sight unseen and they are solely taking the opinion of their agent via phone and email. No pictures or video were taken of the home, its finish details, or the neighborhood. And I happen to know this house looks much better in MLS than in person. Yikes. As a client, they need and deserve much more from their agent. So, beyond being the feet on the ground and email and phone calls, I try to help my clients get a real life sense of the property or properties before they decide to hop on a plane and take a cross country trip only to be disappointed and out $800 bucks. I do not want my clients to be surprised or disappointed after they have made a purchase or spent a lot of money on an inspection, etc. More than once I have had clients cancel a trip out here after my photo shoot on the property. Because, again, it often tells a much different story than the photos in mls. In one video there was a dog barking in the back yard. My client picked up on it and was glad to know a yappy dog lived next door – because it was not going to live next door to her. You don’t see or hear that level of details in the MLS photos. Yes, to some folks reading this, this all sounds self-defeating and crazy since I am in the sales business, right? Yes, well, not that house. But, eventually most everyone finds the house that fits their needs. After meeting with clients, listening to their wants and needs, seeing what they like in photos or on a tour, and if possible seeing their home I quickly get a a sense of their style and can filter many homes for them, hence saving them time . . . and money. My style is down-to earth and honest. Many folks are disappointed when they see their dream home in a different light after I do a photo or video shoot. But, that disappointment quickly turns into relief when they realize they were ready to write up a contract on a house that looks completely different in real life . . . and probably smells too.